At the beginning of the year, as a yearly goal I decided to keep on learning new things. One of the actions I took was signing up for some courses (in Coursera platform). The courses were great, the way of learning is very encouraging: with videos, small and bigger assignments, online forums, students from all over the world helping each other, aspiring career starters and retired people wanting to learn something new together in a global class. I followed them for some weeks but finally I was unable to keep up with them and dropped. I felt frustrated for that. Some weeks ago a friend forwarded some information about some other online course from Stanford University Venture Lab. I decided to follow a couple of them, including “A Crash Course on Creativity” taught by Tina Seelig. Those of you who know me well might think “a course on creativity, how unlikely of Javier?”. Well, I decided to join it because I thought it could be fun… and some of the assignments are fun! “Your challenge is to use TWO HOUSEHOLD ITEMS of any type – to come up with a brand new SPORT. Use your creativity to generate something you have never seen before. If an alien came to Earth and had to quickly make sense of the last half century of History, he could get a first glimpse of geographical hot spots and changes of regime by looking at US Foreign Military Sales program data (please refer to my previous post for an explanation of the program and sources of data). For example, take the figure below. 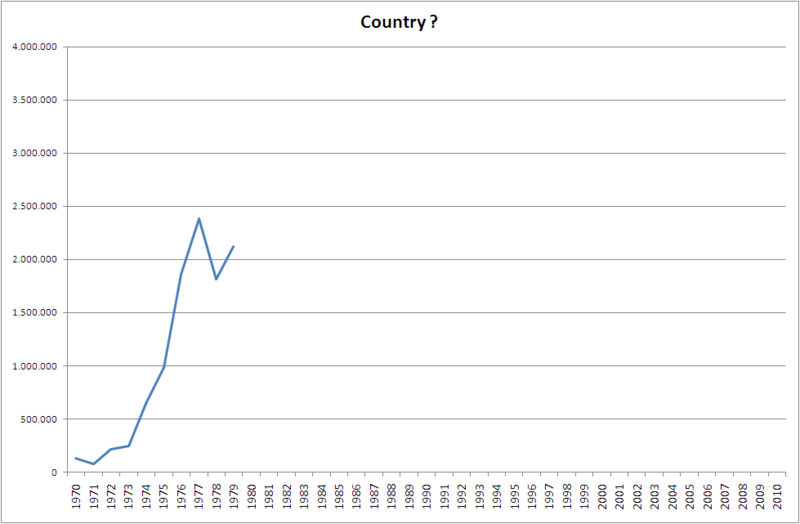 It shows the historical data of FMS deliveries (in thousands of $) from 1970 to 2010. As you can see deliveries stopped in 1980. What is even more telling, in the 4 years to 1979 (from 1976-79) the arms sales delivered to this country represented a whole 34% of the complete US FMS program over that period (see the total volume of deliveries in this graphic from a previous post). Which country do you think it coud be? Which country could this be? This alien, combining these data would know that something that happened in that country, from representing a third of military sales to not taking part in the program ever again… you may have guessed right: Iran, where the Islamic Revolution started in 1978, the Shah left the country in 1979 and at the end of that year the hostage crisis started. 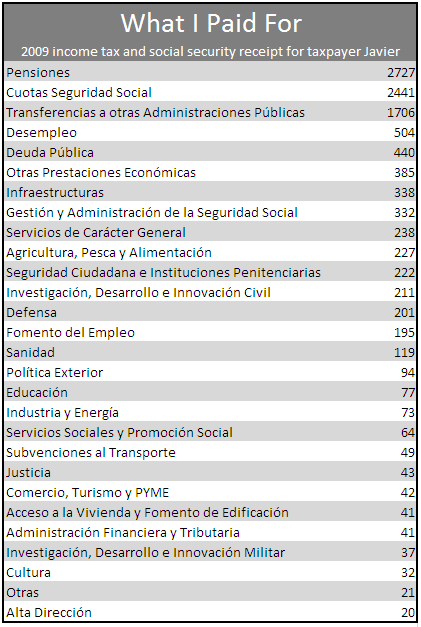 In the graphic you can see that from 1970 to 2005 there were not FMS agreements and deliveries from 2006. Nevertheless you can see that during the 1970’s and 1980’s there were commercial arms sales to Iraq from American contractors (this is also published by DSCA), which deliveries stopped altogether in 1990 (invasion of Kuwait in August 1990 and subsequent first Gulf war). 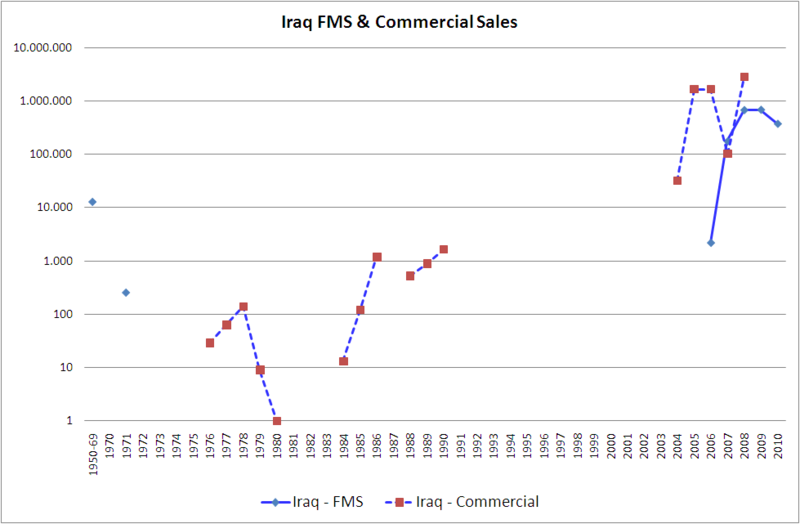 Then, once the second Gulf war had changed the regime, commercial and FMS sales restarted from 2003. Russia: never part of FMS. 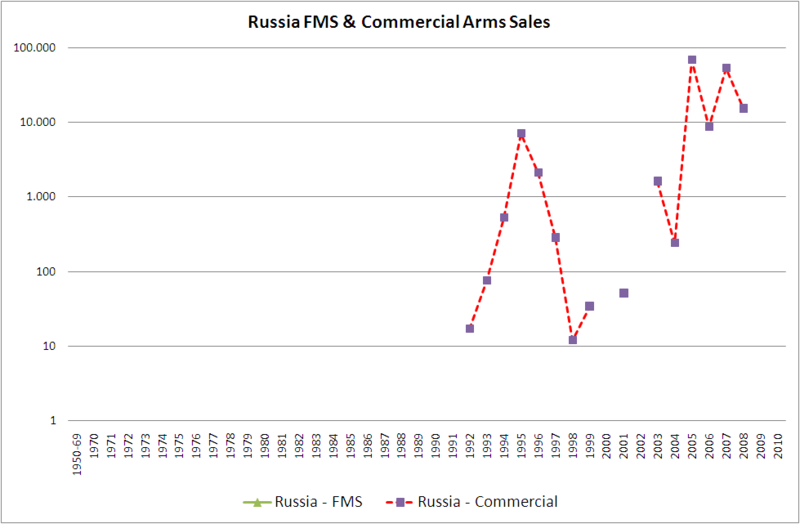 FMS Sales per region (1950-2010, source: DSCA). 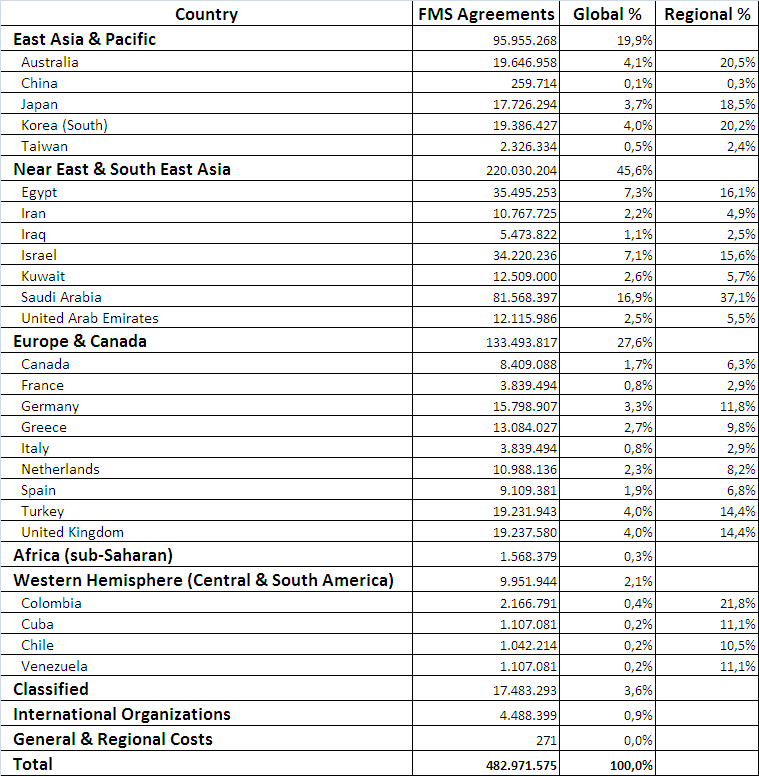 FMS Agreements per region and selected countries (1950-2010, in k$ – source: DSCA). WordPress introduced a feature showing the geographical origin of the visits to the blog back in February (find below a map offered by WordPress – the host service of this blog). After 3 months, I decided to take a look at those stats. Readers’ origin map provided by WordPress. In these three months the blog received slightly above 7,700 visits; over 2,000 came from the United States and above 1,300 came from Spain (my country of origin). The top ten countries of origin summed up 75% of the visits (USA, Spain, UK, France, Germany, Canada, NL, Australia, Ireland & India). Following the famous “80/20 rule” or a Pareto distribution, the top 20% of the countries of origin summed up 85% of the visits (out of 117 countries). Pareto distribution of blog readers per country of origin. Finally, I had the curiosity to analyze the origin by world region. For this purpose, I compared the proportion of readers to the proportion of world population, internet users and internet penetration per region (internet users/population). 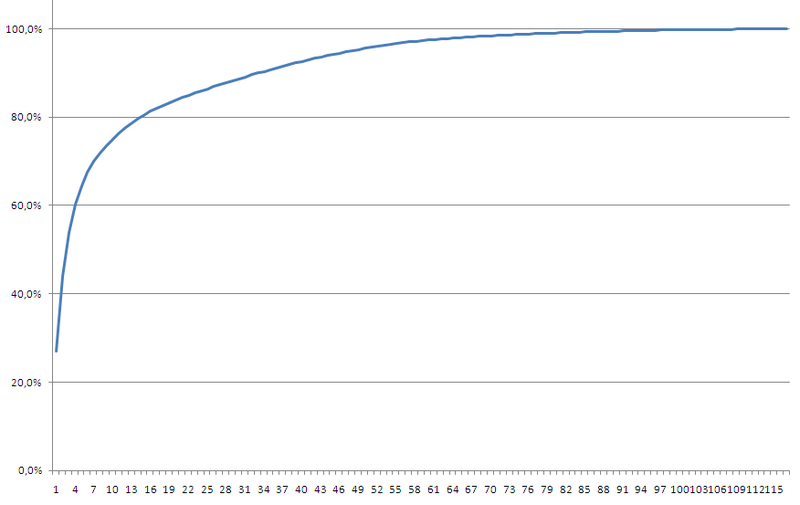 Blog readers, world population, internet users and internet penetration. Europe, mainly due to Spain (my family and most of friends’ origin), is overrepresented (higher % of readers in relation to internet users). The other two regions overrepresented among readership are North America and Oceania, this must be due to the fact that most of the blog’s articles are written in English. Those three regions are also the ones where internet penetration is the highest. China. 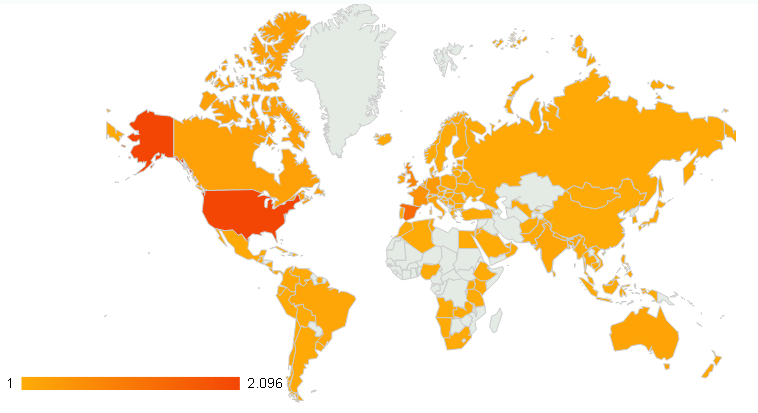 In the last 3 months my blog only received 8 visits from China, that is 0.1% of the visits. China with over 1.3 billion inhabitants represents almost 20% of the world population; it counts with over 500 million internet users, over 22% of the total; and the internet penetration is above 38%. China is clearly underrepresented among the countries of origin of the readers of the blog (0.5%). Shall I start writing more about China or in chinese language? The explanation in the Wikipedia is astonishing, I recommend that reading. 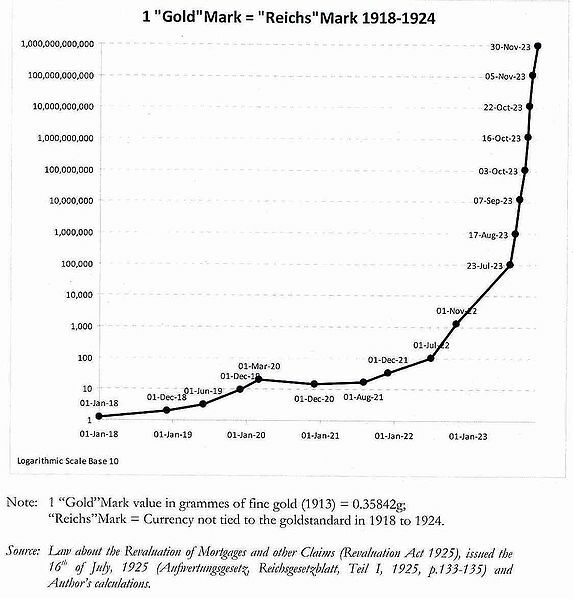 The situation only stabilized when the Retenmark indexed to gold bonds was introduced at the end of 1923, by then there were notes of 1,000,000,000,000 marks (and even so there were two other cases of higher hyperinflations in History, in Hungary and Zimbabwe!). 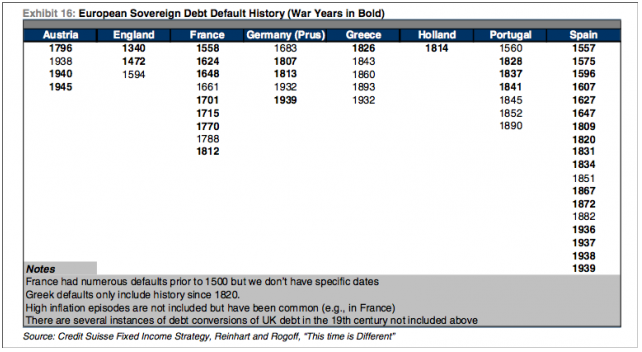 Even though during those hyperinflationary years the Weimar Republic Germany did not default, Germany did so in 1932 and 1939, being those of the latest defaults in Western Europe… later than the latest from Greece or Portugal, as can be seen in the following table. Sovereign Defaults in Europe. Source: Reinhart and Rogoff, “This time is different”, via Credit Suisse. Finally, you may also see in the table that now, after 72 years since the end of the Spanish Civil War, we are living the longest period since 1800 (and second longest since 1500) that Spain has not defaulted on its debt! I am not sure whether this should be a source of calmness or worry.